Nick Maxwell has become a very popular corporate speaker, his thoughts on leadership and teamwork are now utilised by sporting and business organisations throughout the country. Nick covers his journey from an average teenager to getting his first look in at Collingwood, to eventually becoming a premiership captain. He speaks about leadership, persistance, and what it takes to be successful in any job. Another way in which he can be used is through hands on coaching at football clubs. Nick will take your team – any age group – through their paces, offering the instruction and wisdom that he has gained throughout his AFL career. 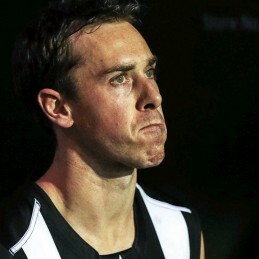 As the most recent Collingwood Football Club premiership captain, Nick Maxwell’s story is one of courage and perseverance. Maxwell was drafted to Collingwood at pick 15 in the 2002 rookie draft, not before being completely overlooked by AFL recruiters at the end of 2001. Originally from St Joseph’s College in Geelong and via the powerful TAC Cup club Geelong Falcons, Maxwell was always regarded as a leader. His ability to remain mentally strong and focused through the initial setbacks is a strength he has carried throughout his AFL career. Maxwell’s rise to the very top has been remarkable. During the pre-season of 2008 Maxwell was handed Nathan Buckley’s famous number 5 jumper and named vice captain to Scott Burns. In the post season of that year he was named captain of Collingwood Football Club. Maxwell excelled from the front in his first year as captain, gaining All Australian selection in 2009 for his role across half back and coming second in the Copeland Trophy to Dane Swan. In 2010 Maxwell reached the pinnacle of his career, standing on the premiership dais at the MCG as the 2010 Collingwood FC premiership captain. He still remains as the current Collingwood captain and when he retires from AFL football will go down in history as one of the club’s greatest leaders. Maxwell’s story of “never lose sight of your dreams” is truly amazing and can be related to business as much as sport, in fact, life in general. Nick is now the leadership manager at the Melbourne Storm Rugby League Club.